As often noted on this blog, in other writings and to anyone who’ll listen, I have long believed that the best rock ’n’ roll happens indoors at night, preferably in close proximity to air conditioning and cold beer. As a listener, ultra-rare to nonexistent is the show that sounds better and is more comfortable to watch in an outdoor setting versus a club or a theater. And playing outside is usually even less pleasant for the musicians onstage. I learned this early when one of my college bands, the Love Pushers, performed at an Anti-Apartheid benefit on the idyllic green campus of Princeton University circa 1986 or ’87. First on a bill of seven or eight acts, we went on when the sun and the early summer temperature both were at their highest. I remember sweating more than I’d ever sweat before and hearing less of anything my band mates played than I’d ever heard before. I remember hitting my drums and cymbals and getting as much response as if I was hitting pieces of paper; outside, the sound either instantly dissipates into nothingness or comes bouncing back with a jarring delay that makes staying in time nearly impossible. And I remember an incredibly nasty sunburn cutting diagonally across the top half of my face, a result of the sun reflecting on an odd angle off the ride cymbal on my right. Damn, that hurt. 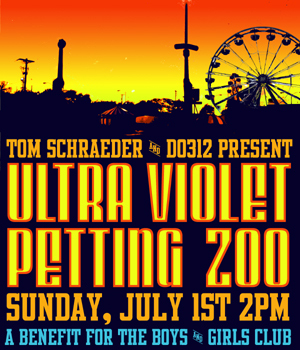 Offered a similar opening slot for a different sunny benefit lo these many years later, kicking things off on Sunday at the Ultraviolet Petting Zoo to aid the Boys & Girls Club of Chicago, my initial reaction was to pass. But the music was being booked by our old friend Tom Schraeder, whose earnestness is hard to resist. It was, of course, a great cause. And Tony and Louie Vortis both were eager for a different kind of live experience—one that wouldn’t happen amid the secure surroundings of concrete, brick, mortar and wood—despite my warnings of the challenges that might ensue. So we said sure. The day could not have started more ominously. As we were driving with the gear to Revere Park off Irving and Rockwell, within seconds, the bright blue sky turned an eerie shade of grayish green; the wind started lashing dirt, gravel and branches at everything in their path, and big dollops of rain started falling with a nasty “thwack” that hurt upon impact. My stupid iPhone weather function reported sunny skies with a mere 30 percent chance of a thunderstorm several hours later, but the much slicker and more up-to-date weather app that Mrs. Louie Vortis had on her portable communications device told a different story: A severe thunderstorm warning had been issued, with the possibility of intense lightning, quarter-sized hail and death and destruction to anyone who ventured outside. Oh, joy; there’s another reason to prefer clubs and theaters. We huddled in the car and watched the 50-gallon drums holding up the fencing on the carnival’s perimeter blow over and roll around, cautiously eyeing the temporary stage with accounts of recent fatal collapses on the forefront of our minds. But after almost an hour of anxious trepidation, just as the event’s organizers were deciding whether to pull the plug, the skies cleared, and clear they stayed for the rest of the day. The show was on, and not even all that far off schedule. Soon enough, I was kneeling on the asphalt backstage, setting up my drums as the delightful smells of grilling hotdogs and freshly made funnel cakes merged with the less pleasant odors from the small corral of pettable sheep and goats and the diesel fumes from the Tilt-A-Whirl and other circus rides. Of course, as soon as the storm passed, the temperature soared, and if the carnival in general felt like the inside of a pizza oven, things were even worse onstage, since the tarp that had covered the platform had to be removed after it tore during the near storm-pocalypse. The sun beat down on my cymbals with such vengeance that by the end of the set, they were too hot to touch; I had to use a towel to take them off the stands when breaking down the gear, though an asbestos oven mitt would have been even handier. As for the show itself: We came. We rocked… and with only slightly less efficiency and stability than usual. The boys had ignored my advice about wearing light colors, though Tony did don his skirt… I mean kilt… and Louie deigned to wear shorts; punk rockers are hard-pressed to part from their hip black uniforms, even at the risk of dehydration and heat stroke. More importantly, however, they heeded my advice about avoiding the number-one temptation when playing outdoors: Overplaying to compensate for under-hearing. Needless to say, as soon as the express train shot out of the station, the monitors that had sounded just fine during the quick line check disappeared completely. 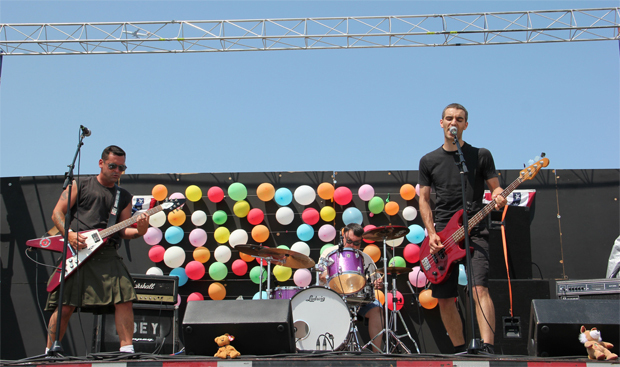 Adding to the sonic chaos, the balloons that carnival organizers had hung to decorate the stage once the weather cleared began popping in the heat, sounding like an off-time backbeat whenever one went. But at least the amps’ volume was enough to cancel the bounce-back off the beer trailer facing us across the audience, and to give us some clue that we were playing the same song at the same time. Body memory carried us the rest of the way; nothing beats being well-rehearsed, especially in a situation like this. By far the highlight of our half-hour in the oven was the covers with which we ended the set, with two guest vocalists invited onstage because they’d always wondered what it was like, and because it seemed like an appropriate nod to the hosts we were helping to benefit. 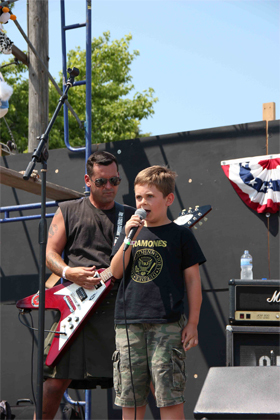 Soon-to-be-third-grader Fender Vortis led us through one of his favorite songs by his favorite band, “53rd & 3rd” by the mighty Ramones, while soon-to-be-high-school-sophomore Melody Vortis tore it up on the Wire classic “Mr. Suit,” a song that we’ve been singing together since… well, ever since she could sing, though we changed the lyrics a bit back then, and did so again on Sunday, mindful of the family- and goat-friendly setting. For the Vortis dads, it couldn’t have been a better day after all. . . though, truth be told, it still would have been better inside.